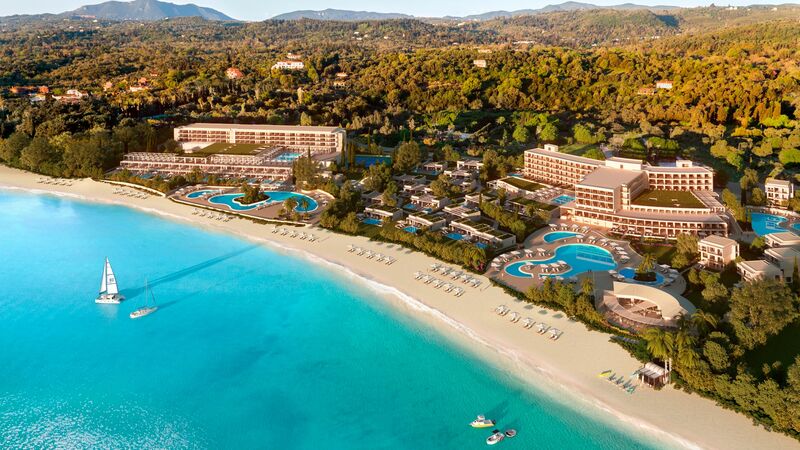 Dassia Bay holidays take you to Corfu’s east coast where you’ll find turquoise blue waters and soft golden sands. The town is surrounded by fragrant pine forests which make it perfect for explorers wanting to hike or mountain bike, while there are plenty of opportunities to simply relax and enjoy the views from the comfort of your sun lounger. Active visitors to Dassia Bay can make the most of the water sports available on the unspoilt beach, with banana boat rides perfect for families and water skiing for older guests. The town itself offers a small selection of restaurants where you can choose from menus of creamy dips, fresh seafood, and warm breads. Wash this down with cocktails and fine wines in one of the local bars as you listen to live music or simply relax and wind down for the evening. If you want to pick up gifts and souvenirs to take home, there are plenty of shops to explore in the town. Holidays in Dassia Bay centre around its unspoilt stretch of golden sand. It’s a tranquil resort with spectacular surroundings, a small collection of shops, bars and restaurants, and water sports on offer. Corfu Town is just a 20 minute drive away and offers a further selection of restaurants, bars and clubs, while Ipsos is within walking distance. Here you’ll find ancient ruins, beach bars, a curved shingle beach, and a lively atmosphere. Book your luxury holidays in Dassia Bay with Sovereign today and we’ll help you get the most from your trip. Our Trusted Advisers are travel experts who will take the time to get to know you before recommending one of our carefully selected hotels. Choose to stay at the IKOS Dassia and you can enjoy the spectacular views the area is so well known for, as well as an all inclusive service like no other. Swap warm buffet foods for carefully crafted dishes, pool games for yoga and pilates and lukewarm wines for a choice of fine bottles from the hotel’s cellar. Transfer time from Corfu airport to Dassia is approximately 30 minutes.